As the busy spring season heats up, home flippers and rising real-estate prices are building a solid foundation for renovation businesses. Home values have steadily climbed higher over the last year. According to the latest S&P/Case-Shiller Home Price Index, prices across the country gained 5.3% in the 12 months ended in February. Consequently, homeowners and investors continue to raise their bets on the housing recovery, driving demand for home-improvement products and services. Pricing trends appear to be split between the top and bottom of the market, as limited inventory is increasing the value of more affordable homes. Zillow (NASDAQ:Z) Chief Economist Svenja Gudell said the number of homes for sale in the lower two-thirds of the market fell 10.4% year-over-year in the first quarter, compared to an overall decline of 5.9%. Tarantin noted that HRI’s brands, a portfolio that also includes Chem-Dry, cater to homeowners with large and small budgets, a strategy that paid off during the market’s downturn. “We’ve seen improvements in our business because of the real-estate market, but when the market was soft, people were taking advantage of the value services that we have,” Tarantin told FOXBusiness.com. While retail sales took a breather in March, consumers continued to spend more on upgrading their homes. The U.S. Commerce Department said sales from building materials, garden equipment and supply stores jumped 10.8% to a seasonally adjusted $30.2 billion in March, the most recent month of data. Compared to February, home-improvement spending rose 1.4% versus a 0.3% decline in total U.S. sales at retail stores and restaurants. Sales of home furnishings also bucked the overall trend with 0.3% growth sequentially. More sales growth is expected this year. The Home Improvement Research Institute and research firm IHS estimated that 2016 product sales will rise 4.7% versus last year, according to their full-year forecast. One catalyst for home-improvement activity is house flipping—the practice of buying a home on the cheap and selling it for a profit, often after renovations. 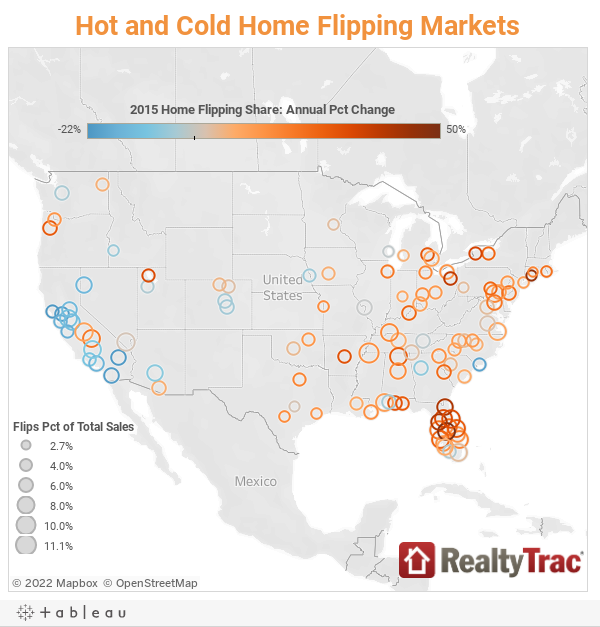 RealtyTrac found that approximately 110,000 investors or entities completed at least one home flip in 2015, which marked the best year for home flipping since the financial crisis. “As confidence in the housing recovery spreads, more real estate investors and would-be real estate investors are hopping on the home flipping bandwagon,” Daren Blomquist, senior vice president at RealtyTrac, said in a statement. HRI has benefited from providing services to house flippers, but Tarantin emphasized that industry growth is much broader. He said franchisees have served more customers thanks to the rebound in real-estate transactions, as well as new consumer trends like “healthy home” products. Chem-Dry offers cleaning services for carpets, upholstery, countertops, tiles and rugs. “Customers will clean and improve their homes before they sell, and certainly after people move into a new home, they’re spending the money to make it better for themselves,” Tarantin added. For HRI, another sign of a strengthening industry comes from entrepreneurs. Chem-Dry and N-Hance Wood Renewal signed up 220 new franchises in 2015, which was HRI’s best year since 2006. N-Hance also has a partnership with Home Depot (NYSE:HD) that offers cabinet and floor refinishing services to the retail giant’s customers. Home Depot is scheduled to release first-quarter earnings on May 17. Its smaller rival, Lowe’s (NYSE:LOW), will report its financial results a day later.